Nano Control offers an innovative, unique and revolutionary solution for air purification. 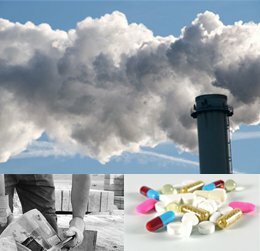 Nano Controls product captures to an unprecedented extent the harmful nano-particles, and micro particles emanate from various industrial emissions. This is possible through a more efficient centrifugal particle separator, where the particles and the air is forced to flow in a particle separator, which consists of various separation steps. The large and coarse particles are first separated and collected at the bottom of a container and the finer particles (nanoparticles) are transported with "clean air" to consecutive separation step where they are trapped and collected in another container. The Nano Control product will in most cases be a component, a kind of additive, which can be connected to existing systems, but may also, where appropriate, could be used as a standalone product. Nano Control particle separator contribute to reducing environmental impacts from industrial production, natural process and human activities and help to creating safe and clean working environment.